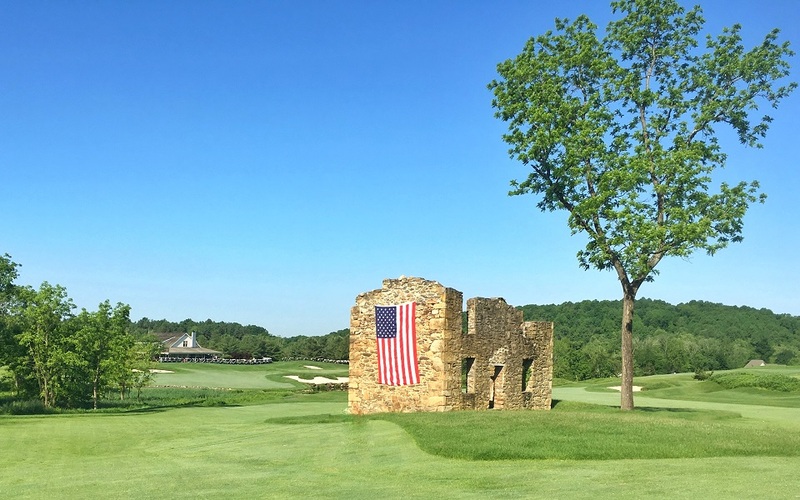 A challenging starting hole which features a 19th century stone barn which serves as a backdrop to the green. Players hitting a left to right tee shot will find themselves in optimal position for their second shot. Try to cut too much of the corner of the dogleg and you may end up in one of the two deep fairway bunkers protecting the right side of the fairway. Wide landing area makes this relatively straight par 4 a good opportunity to make birdie early in the round. Fairway bunker on left is reachable and bunkers on both sides guard the green. Bunkers guard both sides of the green. Slightly uphill tee shot makes the hole play 10 yards longer than yardage indicates. Natural rock outcroppings frame back of the green. 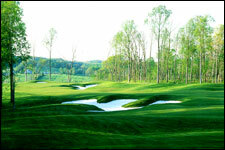 The tees provide a dramatic panoramic view of holes, 1, 2 and 14-18 as well as foothills of the Catoctin Mountain Range. The fourth hole begins a stretch that cuts through a mature stand of trees. Tee off through a chute to a 70-yard wide landing area, one of the most generous on the course. Demanding uphill second shot to another wide landing area. Hole #4 features a two-tiered green with a small pot bunker on the right side ready to capture a wayward approach. Course Designer Ernie Els comments, "This is just a great driving hole and we have given our players plenty of room off the tee (70 yard wide landing area)," Els said. "Considering the second shot is slightly uphill, I don't think many players will reach this hole in two." On this day Ernie hit driver-driver to 15 feet. 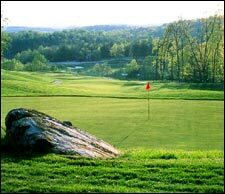 Standing on any of the five tees, golfers are provided a spectacular view of the Maryland countryside. On a clear day, both the Catoctin and Blue Ridge Mountain Ranges are visible. 100 feet of elevation change from tee to green. Natural 30-foot high rock out cropping frames the back of the tee complex. 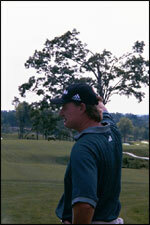 Players face a strategic decision off the tee. Play a long iron for placement or play a fairway wood and shape it around dogleg - leaving less than 100-yard shot to the green. Hitting a wood will bring both fairway bunkers that guard the left and right sides of the fairway into play. This hole features one of the smallest greens on the golf course. Shortest par 4 on the golf course. Generous landing area with fairway bunker on left. Driver is not necessary, but with wide fairway may be inviting. Second shot to elevated green guarded by deep bunker facing fairway. Although short in length, birdie is not automatic. Shortest par 3 on the golf course. Very large green protected by bunkers front and right. Length and depth of green will make for a very long putt if tee shot is not near pin. A relatively short par 4. Players may choose to avoid large fairway bunker on left side and play for generous landing area to the right, leaving 150-yard shot or less to the green. The bold player may choose to challenge the bunker that requires a 220-yard carry from championship tees to clear the bunker. The successful player choosing this route will be rewarded with a landing area that funnels down towards the green leaving a shot of 115-yard shot or less to the green. One of two par 5's that are reachable in two depending on the chosen tee shot strategy. Large white oak provides visual lanes for the player to shape his or her tee shot. Playing to the left of the tree is the safest route and provides a large landing area. Mounding on the left side of the fairway will force errant shots back onto the fairway. Two shots will remain to reach the green. The bold player hoping to reach the green in two will need to play to the right of the tree and carry a tee shot 225 yards from the championship tee over a fairway bunker. A successful tee shot will leave the player with either a fairway wood or long iron to reach the green. A fairway pot bunker 50 yards from the green must be navigated by the second shot to reach the green and have a chance for eagle. Mounding surrounding the green will return errant shots to the green or prevent from traveling out of play. The design strategy for the par 5 9th hole, one of two par 5's that are reachable in two if the player chooses the more bold play off the tee. Both the 9th and 18th holes at Whiskey Creek offer this risk-reward strategy to player. 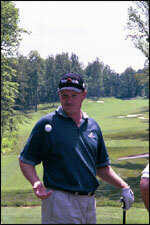 Course Designer Ernie Els comments, "I very much believe in the risk-reward traditional design strategy. You will find many examples of this philosophy throughout your experience at Whiskey Creek."